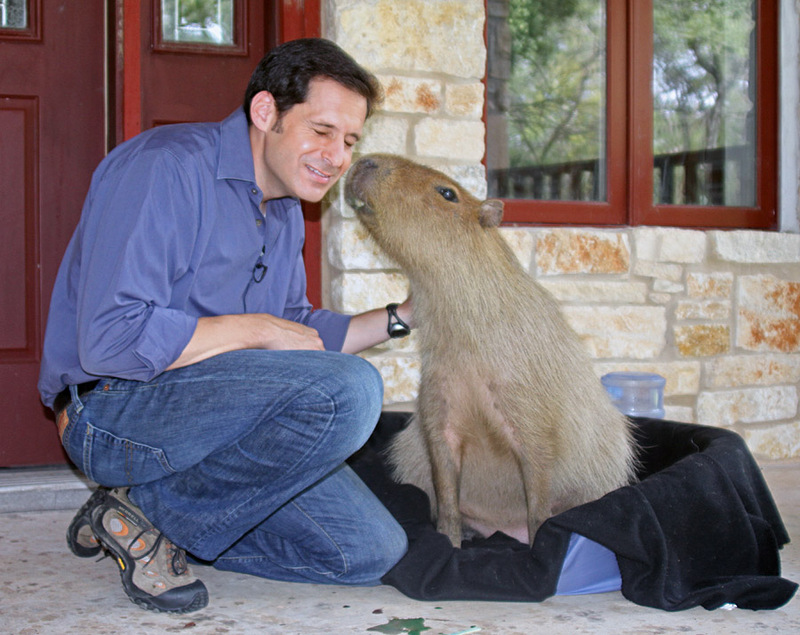 But I can’t be too hard on John, his interview with me on 20/20 (either Oct. 8th or Oct. 29th, 2010) is a great opportunity to advance my cause as Capybara Ambassador. Maybe I shouldn’t even use that photo…nah, it’s too cute not to use. Last Sunday at 9:30 am, the crew for the 20/20 shoot arrived to spend the day with me. It started out fine with a few popsicles fed to me by the crew before they started to film. Then John Berman showed up and came out on the front porch to meet me. Like the camera crew, he brought popsicles, which I was more than happy to eat. After he and my owner chatted some on the porch, they moved to the living room. I don’t like being left behind so I came in too. It was really weird though, they didn’t seem to like where our furniture currently was, everything had to be repositioned. And they brought all these big, hot lights. I sat on the couch to watch (once it’s position was stabilized) and my owner sat next to me. John sat in our (also newly positioned) blue chair. See how they messed up our living room? I was a pretty good capybara for a long, long time while they moved this and fiddled with that. 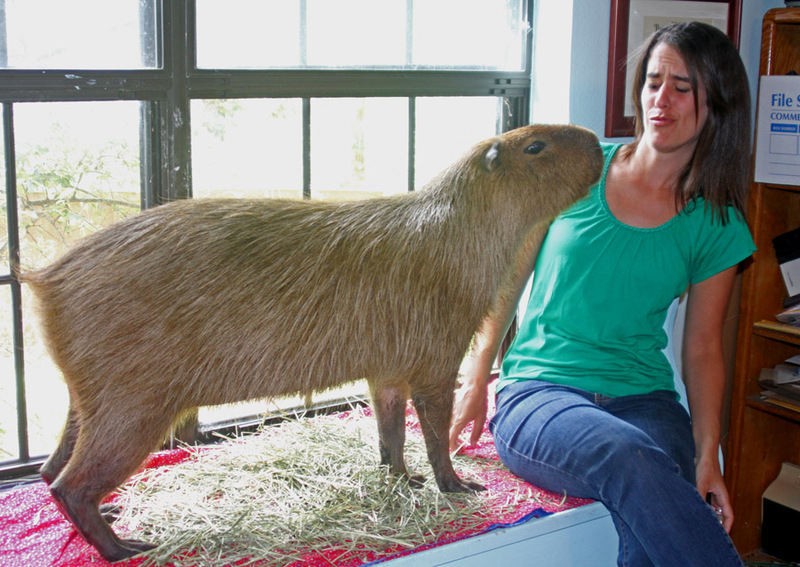 My owner always has a lot of nice things to say about capybaras and about me in particular but I’ve heard it all before–boring! Do you see Capycoppy there at the other end of the couch? He is way more patient than I am! He didn’t fidget at all. Eventually we moved outside. 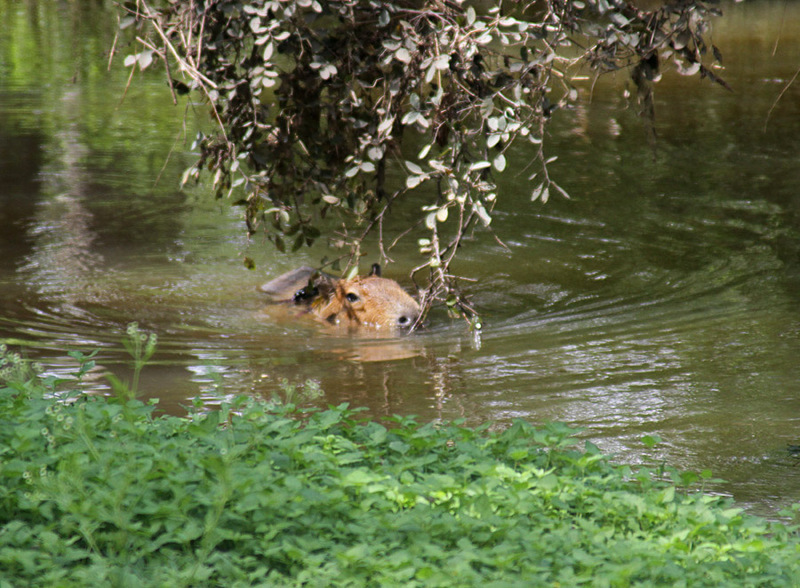 After a brief interlude where I made it clear I wasn’t much interested in swimming in the pool, we went down to Capybara Creek, which was much more satisfactory. I had a fun time in the creek even though I prefer some privacy while swimming, which I totally didn’t get. I got out on the far bank and managed to get a few minutes of grazing in before I was hauled back to the house. We went into the computer room where they filmed me using mind control to get my owner to type for me. I’m not sure exactly what she typed though because after a while Kim Launier sat next to me and started feeding me the seed heads from my Timothy hay. I might have forgotten to give proper direction to my owner during part of that time. Why doesn't Kim want a kiss? Afterward I was so grateful that I tried to kiss Kim but she shied away. That hurt my little feelings. To round out the day, we went out to dunch at a place where they have a playground, a fountain and lots of kids. I did NOT knock that girl over and try to eat her! Dunch was at a sports bar. I’m not into sports or, for that matter, a fan of very many human activities. I tried to ignore the TVs blasting the game at an absurd volume. I liked finding out that so many sports fans are also capybara fans though. Who knew? I got a feel for what it would be like to live in a zoo with the crowd of people watching me through the glass from inside the restaurant. I think I’m happier as a pet. 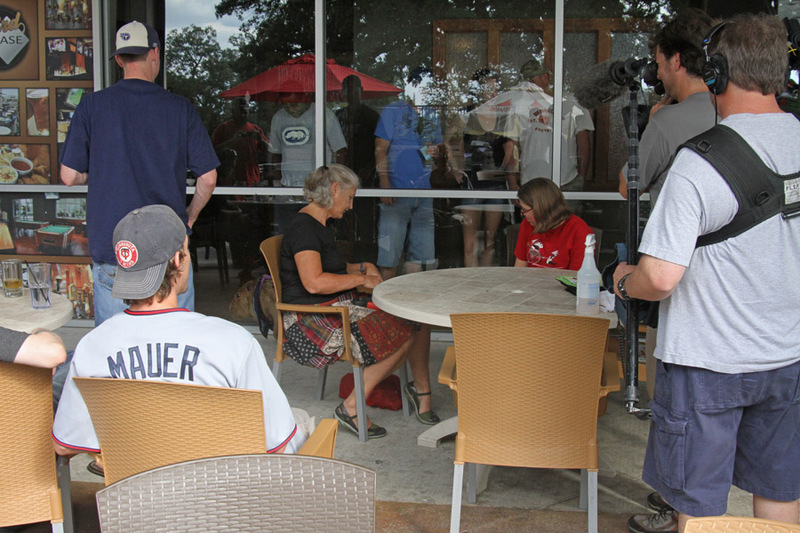 Finally the day was over, the film crew, John Berman and Kim Launier all left. I got a good graze in as the sun set on a hectic day. The good news is that I managed to keep my New Year’s resolution not to bite anyone. The other good news is that I bet I will be super cute when the show airs and millions of people will fall in love with capybaras. If you are one of those people, please leave me a comment! As usual a pleasure to hear your thoughts abt what really went on! Lunch was spelled DUNCH twice, is that a typo or your version of lunch? I can’t wait!!! I will be watching!!! The pictures are great, Caplin. Where was cappycopy??? Can’t wait to see you on 20/20!! PS. I KNOW you will be super cute!! Well, as always, you’re a charmer, Caplin. Loved the taglines and explanatons, too. What’s with the capybara-phobia from John & Kim? LOLOL Oh, and while I can’t wait to see the airing of the actual show, I don’t need a show to fall in love with you and all capybaras. 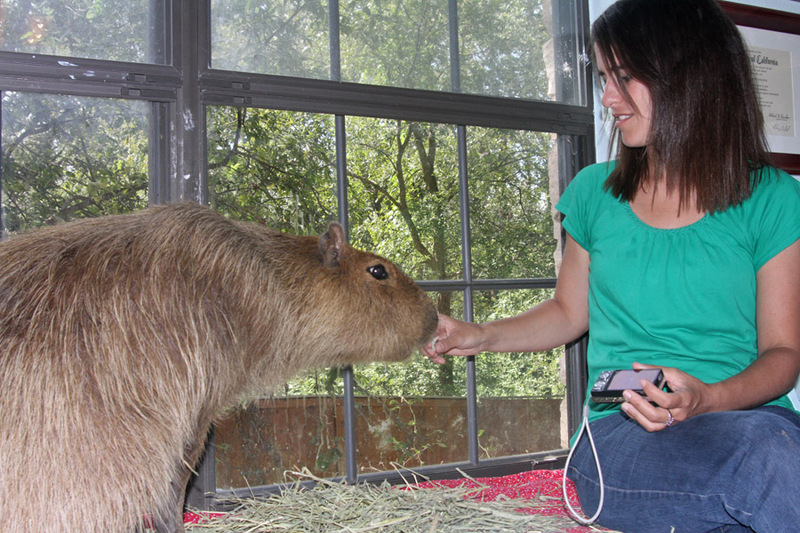 I’m a diehard fan already … especially of my fave Texan capybara. I am so glad that so many more people are going to see you and fall in love with you, like we all already do! You are such a good boy, Caplin, to not bite anyone and you are truly adorable! I will be watching you on 20/20! Love you, as always, Caplin! You just get more and more famous everyday! I will give you a smooch too! What a wonderful post, Caplin! I’ve already fallen in love with you and capybaras. You are amazing on tacos! J/K, Caplin babe. Coral got to me! I love you Caplin Rous! You can kiss ME anytime. 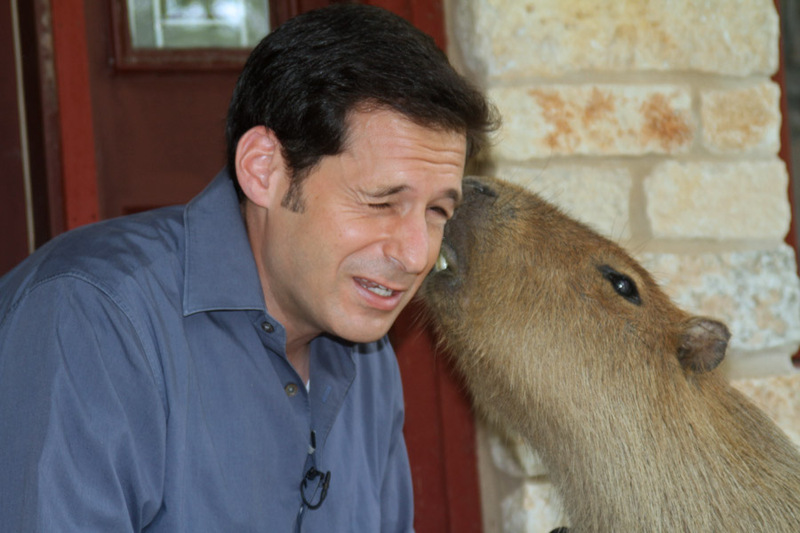 I wasn’t familiar at all with Capybaras until you and John Berman posted on Twitter. I have since become a fan – he is just so darn cute!!!! Caplin, you should have your own show on tv! I’d love to do lunch with you sometime, Cap! Capy, Do you know when the 20/20 segment will air? I am so excited for you. You Rock! I’d TOTALLY let you kiss me, Capy!! So sweet! Caplin: Saw you on 20/20 tonight. You are adorable. I wish I had a capybara. 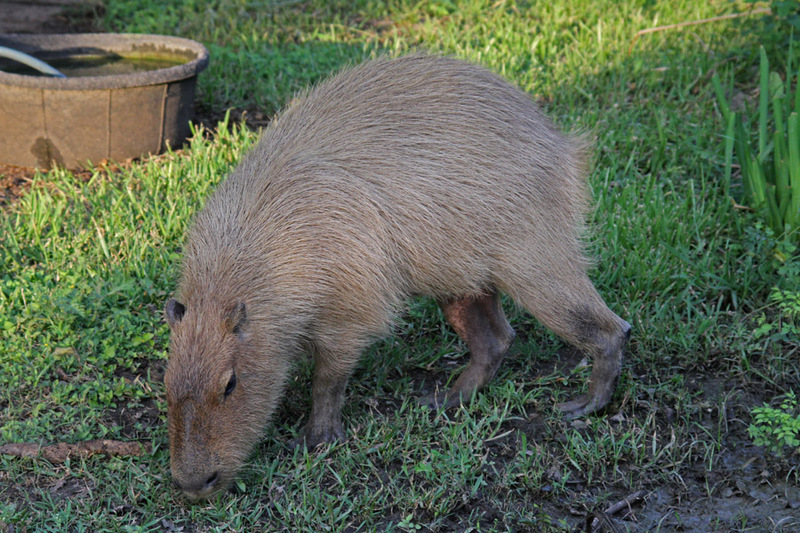 I had actually fallen in love with capybaras a few months ago when doing research for my daughters school report. 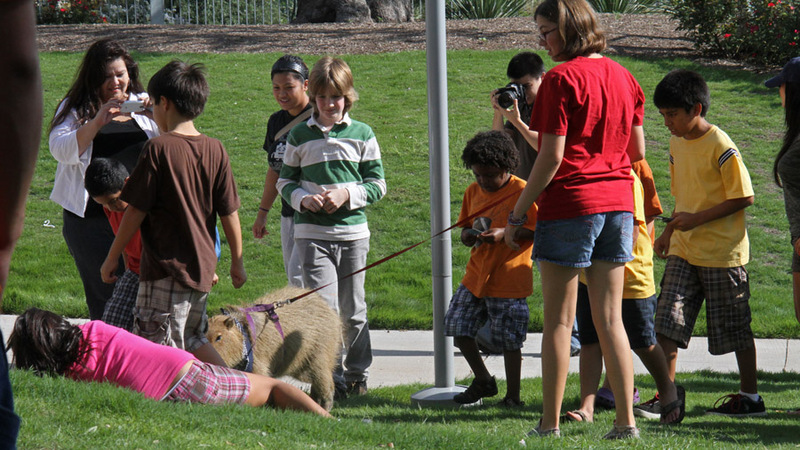 But that was just the IDEA of capybaras. 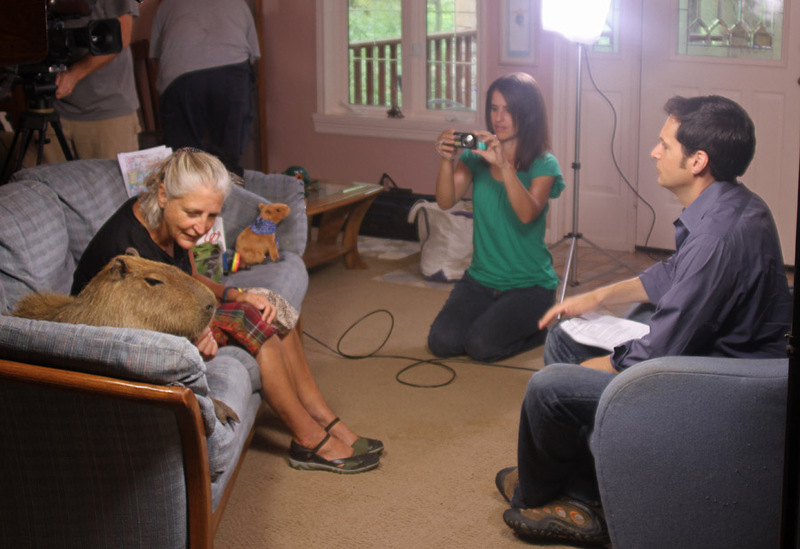 Now that I have seen you – a real live TV star- I am truly in love with capybaras. Do you have any cousins? Fantastic. Have to find the 20/20 story now. I luv the African giant rats too.